This was the day a new park was born, created out of the dirt of a Highway Patrol station. The people of Barrio Logan on this day seized land that was supposed to hold a CHP station. They made it into a park – Chicano Park – which today stands as an historic center for murals, art, Chicano and Mexican-American culture. I was there that spring day. We had formed a large circle, a couple hundred of us, around the dirt pile that stood in the center. At the given moment, we rushed forward and claimed the land. The rest, as they say, is history. It did give me inspiration to do the same thing in Ocean Beach around some vacant city land in northeast OB. It was almost a year later that OBceans took over what was to become Collier Park. So, just remember – those of us who started the campaign for our own park were inspired by the folks of Barrio Logan. Now of course, the park is world-renowned as a center of gorgeous and wonderful murals. 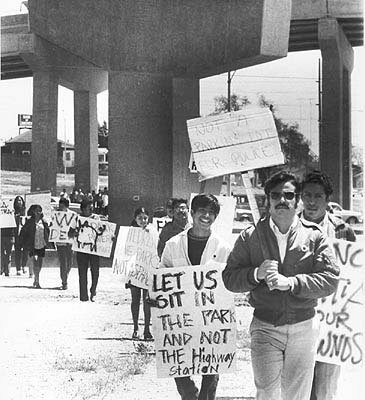 Taking a cue from Chicano activists, the people of Barrio Logan began making demands of their own, one of which was to obtain land to construct a large recreational park that they could call their own. The state of California granted them a tiny parcel of land, but it wasn’t enough for what they had envisioned, so they submitted a request to obtain all of the adjoined land under the bridge. They patiently waited for a response. On April 22, 1970, bulldozers finally appeared on the site and began to level out a huge three-acre piece of land, but they weren’t there to extend the people’s park, they were there to begin construction of a California Highway patrol station. Mario Solis, a brown beret and student at San Diego City College, was the first to hear of the news. Angered he immediately ran out and gathered all of the friends and family that he could and together they all rushed out to the site, formed a human chain and stopped the bulldozers right in their tracks. The Chicano Flag was raised and the land was seized. Mike Amador, director of the Community Action Council in that area, expressed the community consciousness that demonstrations would continue, and that the city had been deceived by the state as to the use of the land in question. Solis, explained that the demonstrators would return the following morning at 7:30 a.m. Students would not return to class, but would remain on site. During the next few days an unprecedented number of students, community activists and raza’s from Barrios throughout San Diego and other parts of Aztlan united to protect their Tierra. The protesters began to work the land, planting trees and flowers. They withstood several standoffs with the police. After 12 days city officials agreed to sit down and negotiate. The people of Barrio Logan finally got the green light to build their park, Chicano Park. The original Earth Day was also held on April 22, 1970, I believe. I just realized that’s why I wasn’t at it – I was at the Chicano Park take-over. we’ll always be indebted to the people of Barrio Logan for their example. thank you. 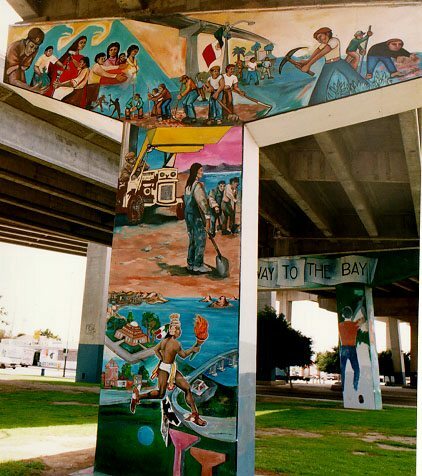 Chicano Park is an amazing place, and if you’ve never been there you are missing out an important slice of San Diego’s life, politics and history. I was there, from the march on broadway to the actiual take over..heady times.. i do believe i am the only one whao has pics of the march, down market, and the actual birth of chicano park..pics are faded, and ive surprissingly keep them all this time..many in the pics didn’t survive the journey..
please copy them? i would love to see those pics!!!! im from san diego, im a brown beret, and a good friend to people who were there at the takeover. contact me at brownberets.blogspot.com asap please. If anyone knows the name the name of the woman who provided the solution, please fill in the blank. And ask Cal Trans to fire a few engineers and hire her. The ongoing story of Chicano Park bears out Jefferson’s sentiment that the “price of democracy is eternal vigilance.” I acknowledge not only the people’s victory at Chicano Park, but their vigilance. Here’s a brief history of the park from Calaca Press. See? It’s great to have been a blog around for awhile. On historic dates, we can just post last year’s blog of the event. Again, an old OB Rag saying: If ya don’t like the news, go make your own. We made history that day, April 22, 1970. 40 years ago. Now: All the way to the bay!